Today’s a Sunday! And you may be “busy” doing something or the other. Like watching TV. Or catching up on your reading. Or running errands with your kids or for them. You may want to do several things today which you can’t do during the week. Which is why I cautiously say you may well be busy! But have you considered doing nothing? And just being in a state of nothingness? Let me share some learnings that will also help clarify some myths we hold about doing nothing and being in a state of nothingness! Doing nothing does not mean not thinking. Because the mind can never be thoughtless. Doing nothing is about getting your mind to be alive than active. About getting it to differentiate between ‘action’ and ‘activity’. The human mind, research has revealed, on an average, processes 60,000 thoughts daily. A good portion of those thoughts are about different forms of activities. About getting things done. Or they are about debilitating emotions like worry, anger, guilt, anxiety and such. 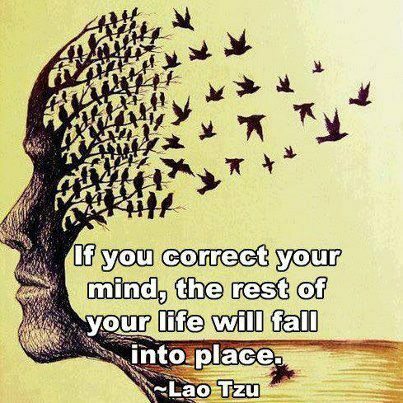 The mind goes on churning these thoughts leading to a series of activities at a pace that defies logic. Which is why half the people in the world are struck by stress even before they are 40! Doing nothing slows down the mind. It will still process 60,000 thoughts, but at a manageable pace where they will lead to mindful action and not mindless activities. A mind that has experienced that state of nothingness is more aware. When you are hungry and you eat, it is action. When you just keep on tucking into the next cookie or samosa at the conference table at work, that is just activity. When you are listening to your child talk about her day at school, and watch her every emotion, then it is action. When you merely hear her speak, but choose to check your mobile phone for mails, it is activity. Our daily lives are filled with thousands of such activities and very little or no inspired, informed and intelligent action. Which is why we are unhappy. Which is why we feel a sense of loss __ of working so hard and yet not enjoying it! Nothingness cannot be experienced by doing something about or for it. It is about being. Sundays are a great time experience nothingness. You literally don’t have to do anything. Or necessarily go anywhere. No posture is required. No preparation is needed. Just spend a good part of the day being silent. You be silent, that’s enough. There is no need to silence the environment. Look at an inspiring sight, from your window or balcony or terrace, of Life itself. You can possibly see a tree or a garden or a street. And simply watch Life happen. Now this is important – as your mind strays towards a worry or a schedule for tomorrow or a painful memory, just bring it back to attend to Life as you are experiencing it. Remember the mind is like the human body. It will resist any new regimen that you insist it embraces. Besides, the mind, through years of your “worldly-wise” conditioning, has confused itself into a perpetual, stupid, silly “hyper activity” mode. In fact, unless you tell your family that you are embarking on this “unique experiential journey”, chances are that you be chided for being lazy, for “doing nothing” and will be demanded to help with the dishes at least!!! Remember also that through your entire nothingness experience you must be silent. Our focus eventually is to stop the endless chatter in your mind, to calm it down and for it to think and act intelligently than just react hyperactively. Your physical silence then is a simple, but important, contributor in that direction. 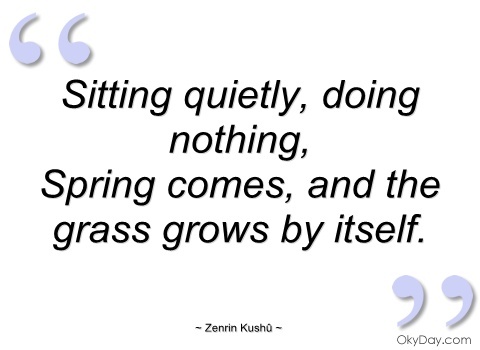 The founder of Taoism, Lao Tzu (600 BC ~ 531 BC), wrote this famously, prophetically too, in his book “Tao Te Ching’ (The Book of THE Way): “Doing nothing is better than being busy doing nothing.”It is such a profound and yet so stark, awakening, revelation of our lives in. In our perpetual hyper-active mode, doing things and getting things done, we have lost the ability to simply be. We are extremely busy. But when we look back we have done nothing memorable in terms of living __ intelligently! The years have gone by. But we have still not lived our lives completely. We have been taught again, sadly erroneously, that an “empty mind is a devil’s workshop”. So we have allowed our mind to be filled with gibberish __ worry, fear, anger, sorrow. We have allowed our mind to always be in a frenzy __ processing one activity after another, as if it were a sausage machine. This frenzy may have helped us created more wealth, more assets, but has robbed us of our health, our inner peace and has left us searching for happiness! If we haven’t been happy with our Life, what’s the point in having lived it? Haven’t we then been simply busy doing nothing?! Only when we empty our minds of all wasteful emotions and rid it of all activity, will it experience nothingness. In that state of nothingness is where you will find your consciousness, your Universal Energy recharge point, your bliss.